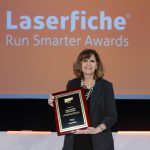 The Laserfiche Client and Web Access come with numerous out-of-the-box search types that allow you to search by a variety of criteria. But, when searching for content in large repositories, it is still important to understand the basics of advanced search syntax. Although intimidating at first, advanced search syntax is a powerful yet simple-to-use tool that lets you combine searches to locate highly specific information. The easiest way use advanced search syntax is to run a search in the Search pane, open Advanced Search, and edit the syntax. This way you don’t have to write the syntax from scratch. 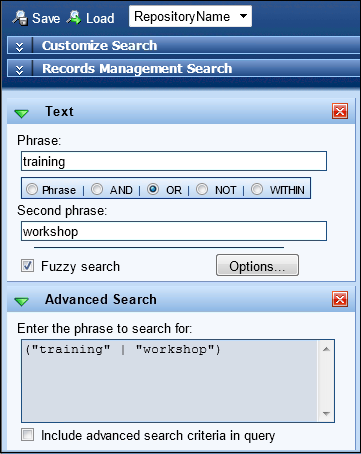 For example, to find expense reports for trainings or workshops hosted in October, you can use the Text search to search for documents whose text contains either the word “training” or “workshop” (Figure 1). 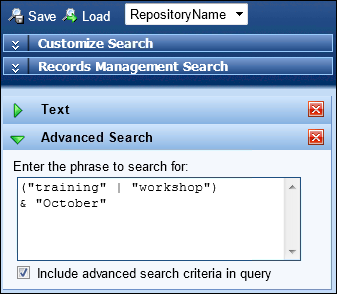 After running the search, the advanced search syntax is displayed in the Advanced Search box and can be edited to include the word “October” (Figure 2). Familiarize yourself with advanced search syntax by opening Advanced Search (from the Customize Search drop-down) while performing searches in the Search pane. Read the Laserfiche User Guide’s Advanced Search topic and get to know search operators and wildcards. Read the Advanced Search Syntax whitepaper on the Laserfiche Support Site. Sign up for CD301: Using Advanced Search Syntax at Empower 2014!